Twisted Road: Would You Rent Your Bike to a Stranger? 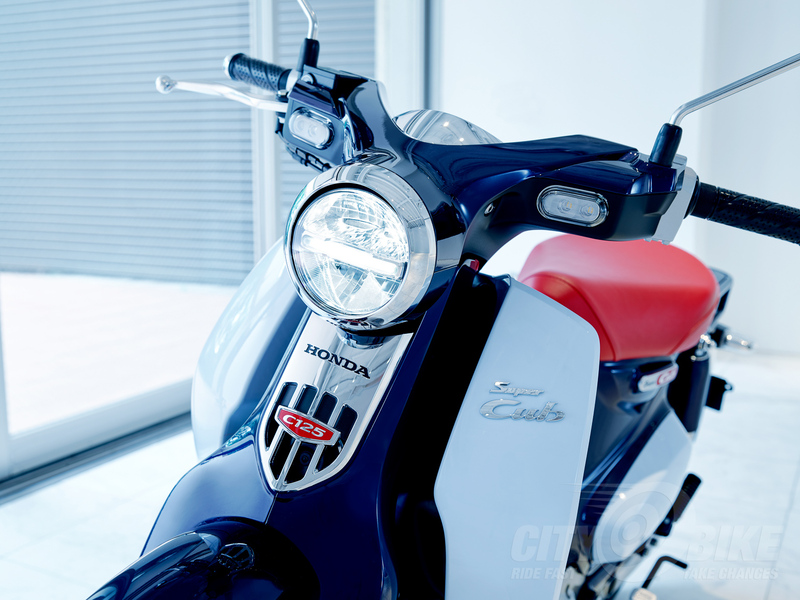 When Honda announced its new minis for 2019 back in June of last year, we went bananas about the Monkey, but didn’t say much at all about the Super Cub C125, which starts at $3,599 with ABS. First introduced back in 1958, the OG Super Cub C100 arrived in the US in ’59 but stopped coming to the US in ’74. It continued to sell around the world, and according to Honda, surpassed 100 million units sold in 2017, making it the best-selling vehicle of all time. The latest li’l step-through, the C125, is coming back to the US for 2019, either as a belated 60th-anniversary celebration of the Super Cub’s debut, or to commemorate the 60th anniversary of the Super first Cubbing to America. Whatever—we’re always down to party on motos, and Fish, who is currently stirring up dust in Johnson Valley even though there’s no King of the Motos this year, will be breaking away from Backdoor and Boulderdash tonight to boogie down to Honda North America’s HQ for their latest press production, the Super Cub C125 launch. Honda will have a hard time beating the all-out awesomeness of the Catalina Island Monkey launch, but word is Fish will get to ride an original Cub in addition to cruising to the coast on a spankin’ new, ABS-equipped C125. Obviously, the first question out of Fish’s mouth is typically “how does it wheelie?” He’s Founder and President of the CityBike Foundation for the Preservation of Front Tires, after all. 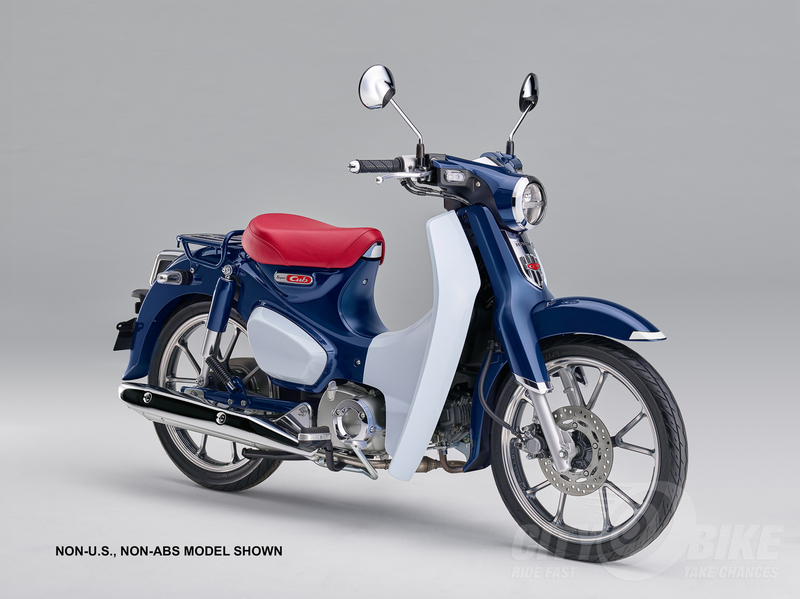 You can check out Honda’s press photos and model overview below—but what do you want us to find out for real about the Super Cub? Tell us in the comments below! 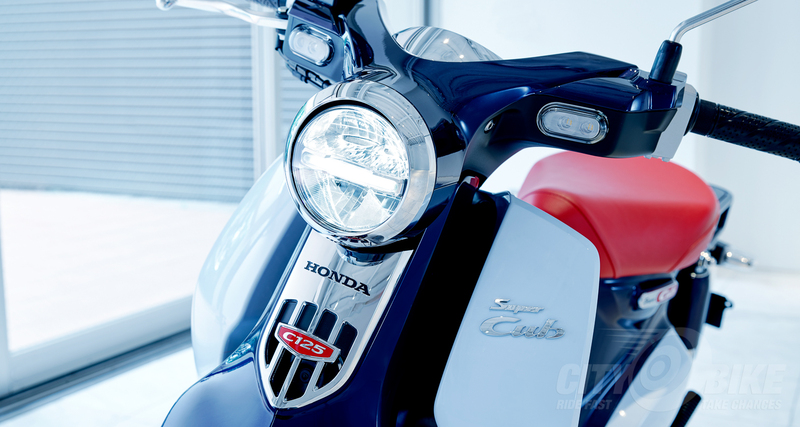 Honda’s classic Super Cub styling provides the cues for the new model, the 2019 Super Cub C125, featuring an S-letter silhouette that reaches from the steel rear fender to the step-through space. There is significant wind protection, with the rider positioned upright and close to the lower fairing, yet the Super Cub C125 is still easy to mount and dismount. 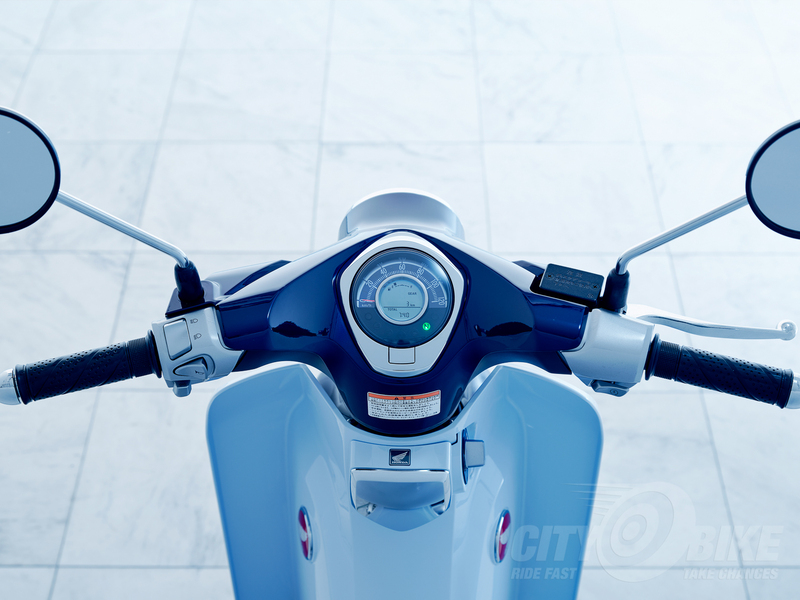 An open cockpit provides the rider with optimum visibility on crowded city streets, while a side cover pocket on the right side offers storage for essential items. As with the very first Super Cub, the Super Cub C125 features an air-cooled single-cylinder four-stroke engine that is designed to offer great power for around-town riding but also be fuel efficient and quiet. Bore and stroke for the 125cc, SOHC two-valve engine is 52.4 x 57.9mm, while the compression ratio measures 9.3:1. Fed by PGM-FI, it produces strong, enjoyable power all the way through the rev range. For noise reduction, the newest version of this engine features a helical primary gear and high-quality crank-journal bearing. Meanwhile, for optimum shift feel and reduced shift noise, the engine has a high-quality shift-drum bearing, shift-arm rubber, and optimized clutch-damper rubber material. A semiautomatic automatic centrifugal clutch makes it easy for new riders to adapt to riding, while still enabling experienced motorcyclists to have fun. 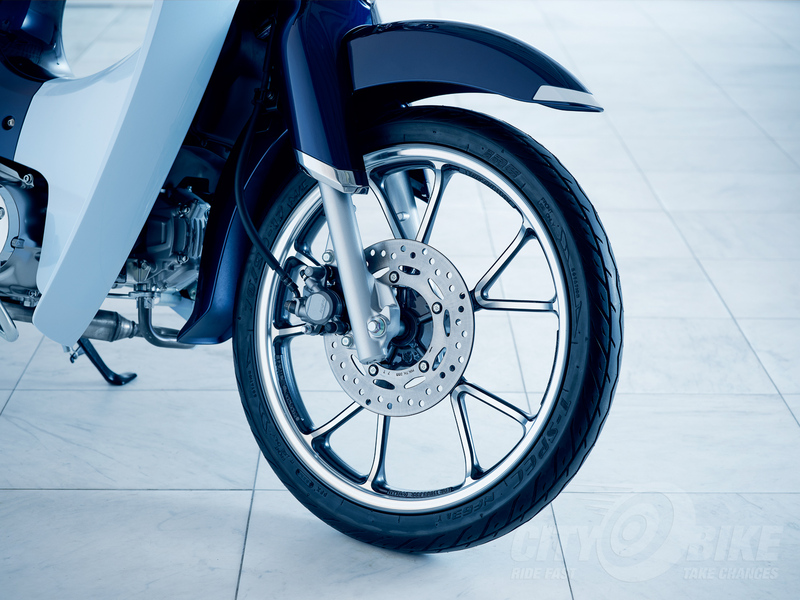 A steel frame with dedicated stiffness characteristics for the engine hanger and head pipe offers a nice balance of comfort and on-road performance, while a rubber handlebar mount, seat mount, and step surface reduce vibration. The high-density urethane seat with thick seat foam is narrow at the front. Front suspension stroke is up when compared to previous C100 models, measuring 3.9 inches, and the twin shocks have 3.3 inches of travel. Stopping power comes courtesy of a 220mm front disc and 110mm rear drum, while the cast aluminum wheels are produced using a special cutting process to enable the use of a tubeless tire; front and rear wheels are 70/90-17 and 80/90-17, respectively. Wheelbase is 48.9 inches, while rake and trail are 26.5° and 2.8 inches for predictable handling. 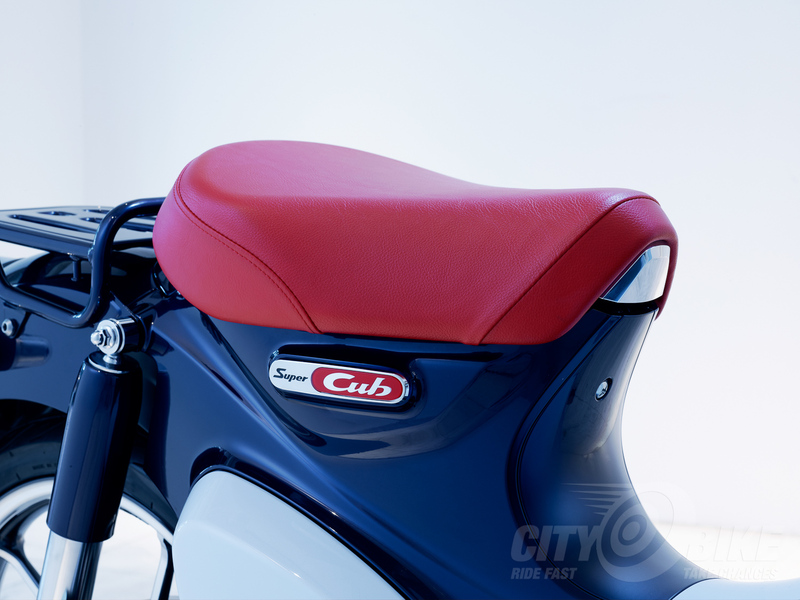 Wet weight is 240 pounds, and the seat height is 30.7 inches, making the Super Cub both easy to get on and confidence-inspiring in around-town riding. Through the incorporation of LED lights, which require minimum space, the Super Cub C125’s headlight shape matches that of the first-generation Super Cub. The meter includes a digital center screen showing two trip meters and six-segment fuel-level indicator, with an outer analog display showing speed. A smart key allows users to lock the seat electronically. 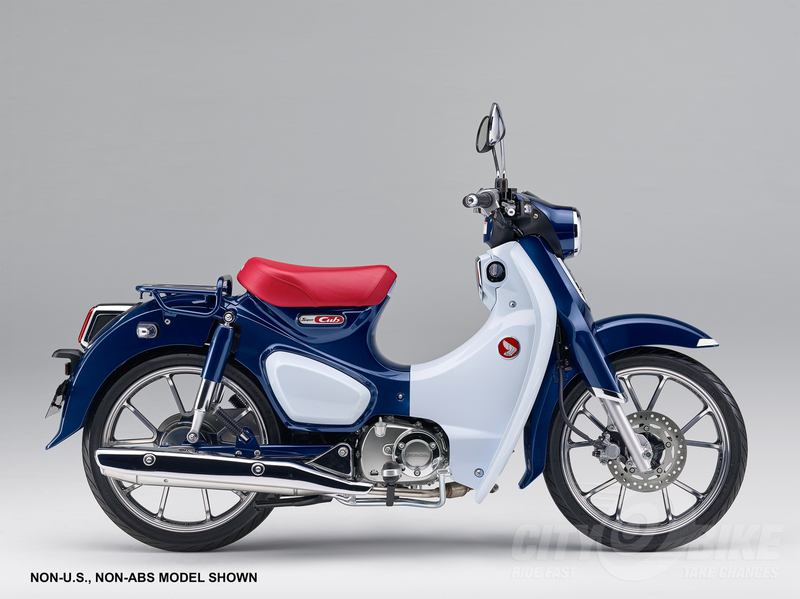 The 2018 Super Cub C125 is available in a Pearl Niltava Blue color scheme.